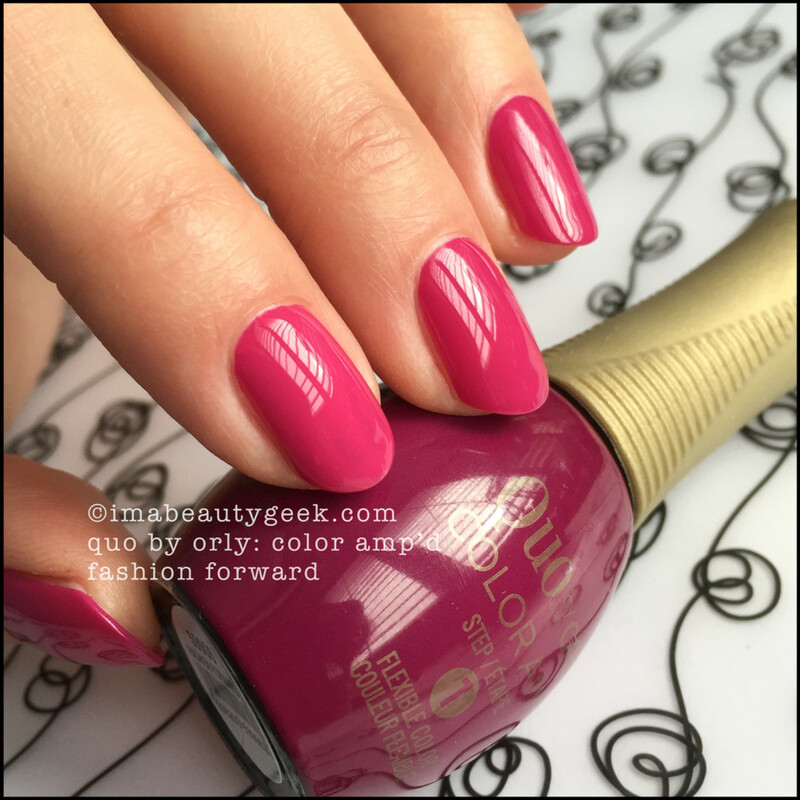 A new line & a serious interview with one of Canada's top nail painters. 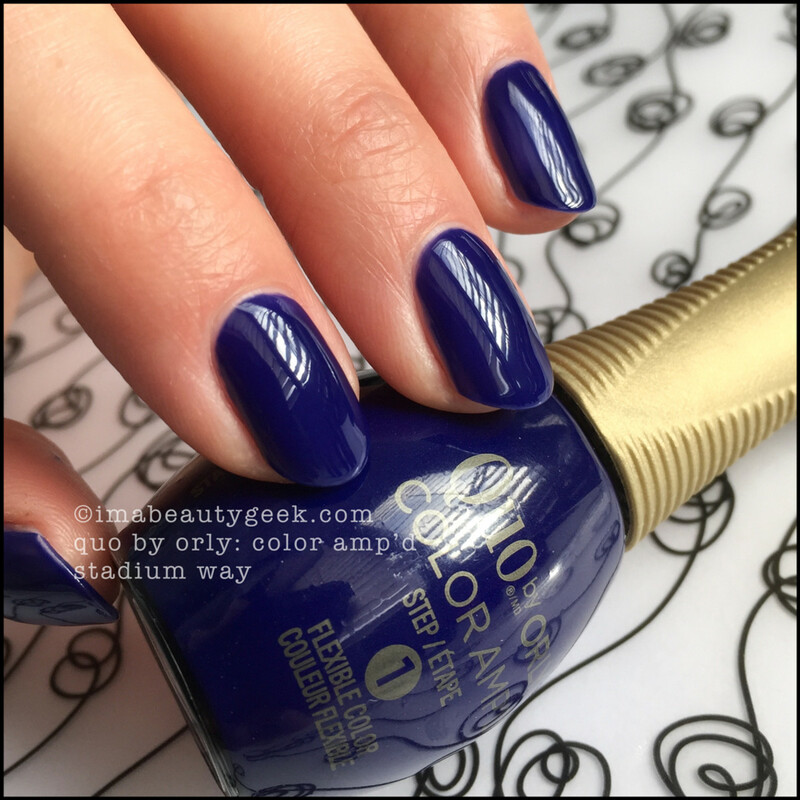 There’s a new line of polish available at Shoppers in Canada. 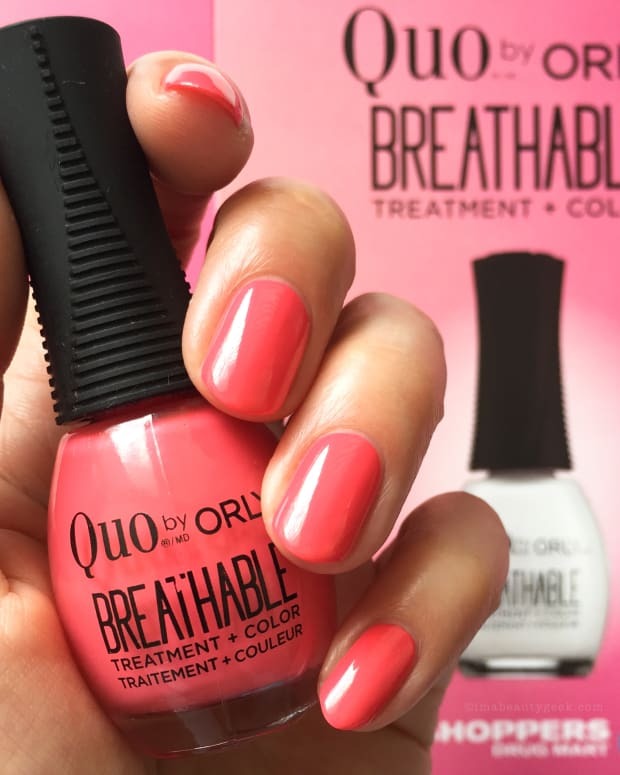 It’s Quo by Orly Color Amp’d and to introduce you to it, how about an interview with the Jose Bautista ESPN Body Issue Cover Manicurist/Shoppers Drug Mart Nail Artist/Brand Ambassador Melissa Forrest? 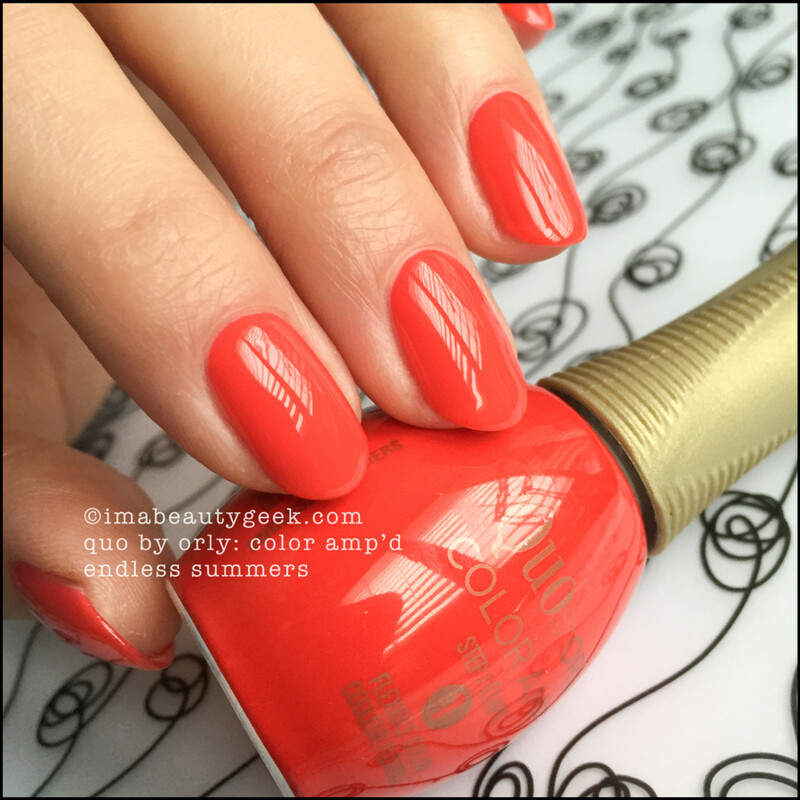 ManiGeek: Do you recollect the first bottle of polish you ever bought? Do you still have it? 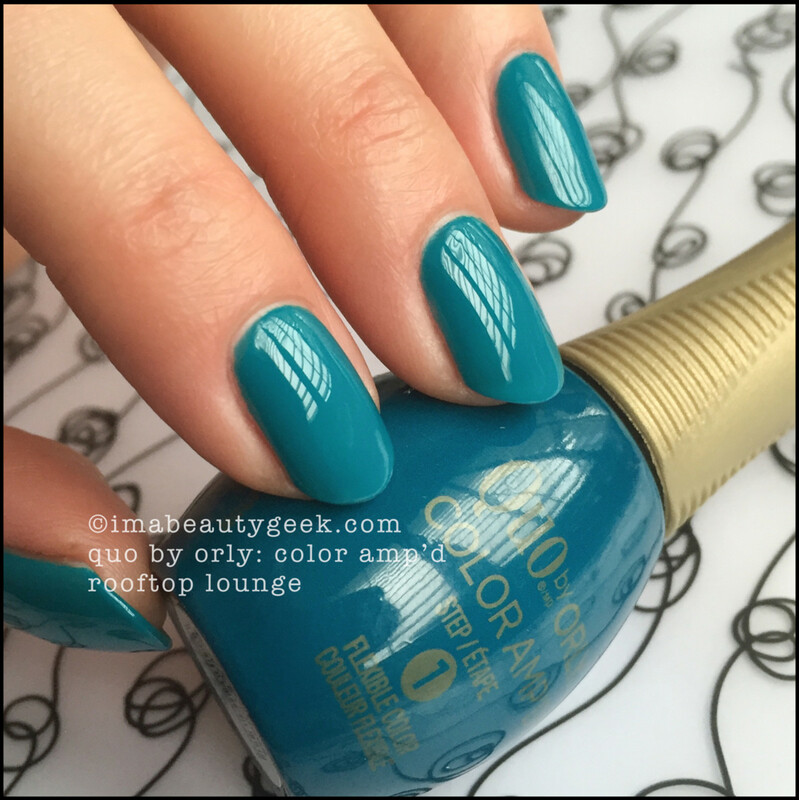 Melissa Forrest: My first colour was a blue that my mom bought me – to this day, blue remains my favourite nail shade. 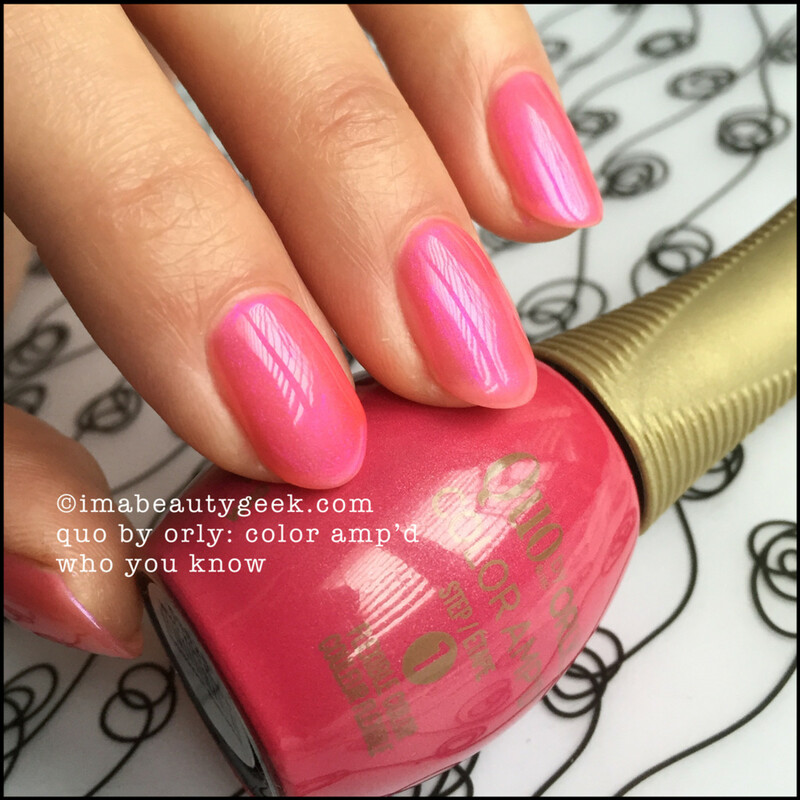 MG: You and I have both played in this Quo by Orly Color Amp’d stuff now and I’m really curious to know your three favourite cheeses. MF: Mmm... cheese. Boursin, Swiss, and Smoked Applewood Cheddar. MG: As a nail artist, do you think it’s important to make your dinner look pretty on a plate before you eat it? MF: Without a doubt! Colour placement and dimension are important. People see colour first and immediately judge the plate by their first impression. Garnish is important too. Garnish is my middle name! 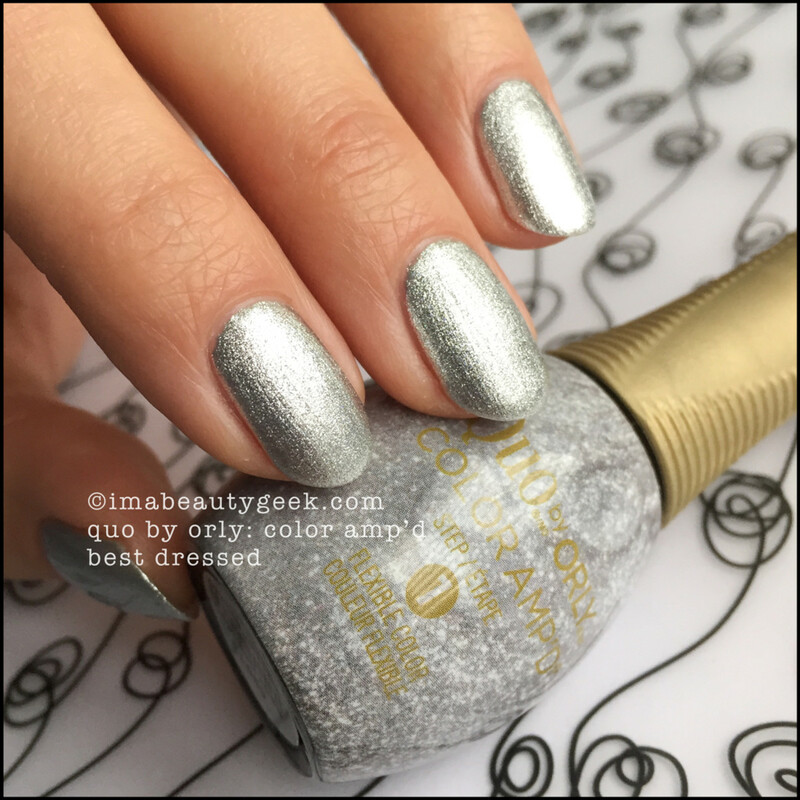 MG: If you were forced to choose, would you rather go without base coat or without top coat? 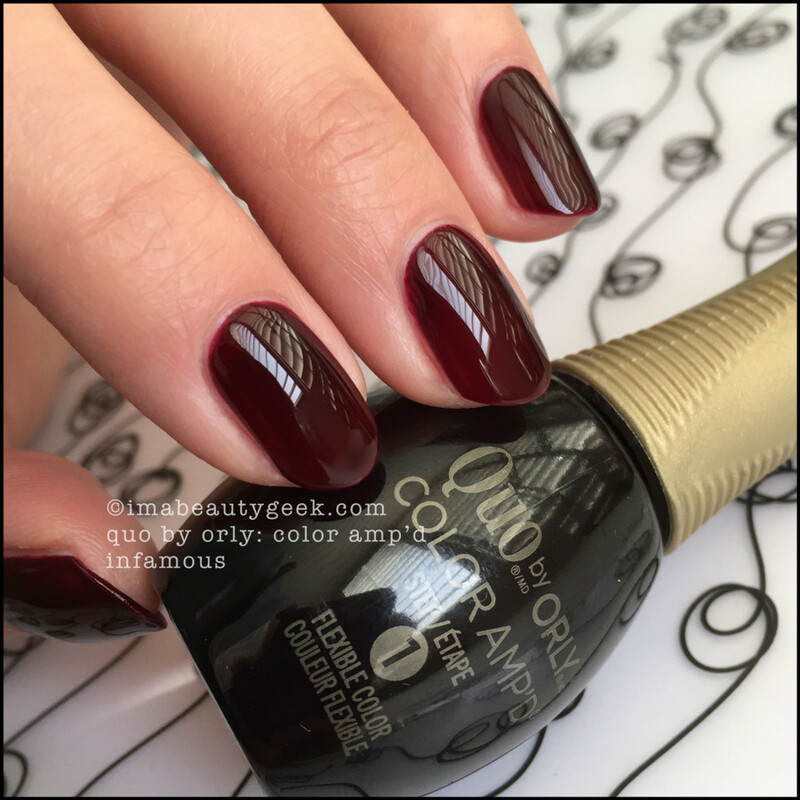 MF: I’d rather go without top coat. 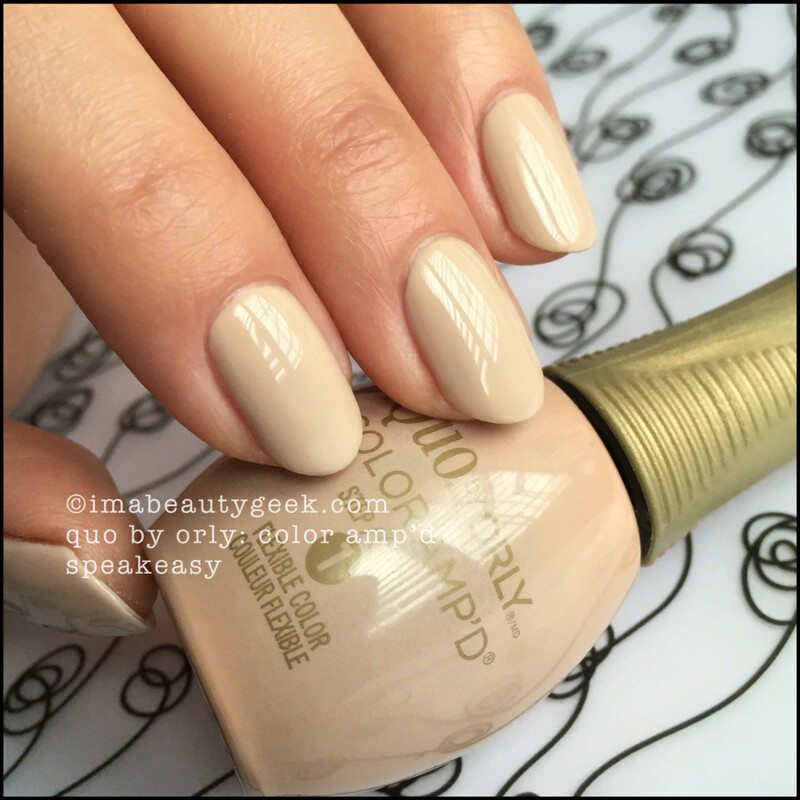 Nail health should always be first; base coat creates a protective foundation for the application of any product. MG: How do you open a bottle of nail polish that’s 100% stuck shut? MF: If I’ve spent five minutes running the cap under hot water and it still won’t open, I aim for the garbage and slam dunk it into the can (even though what I really want to do is throw it against a blank wall and see what design it creates). It’s always a good idea to wipe the rim of the bottle down with acetone or remover before putting the lid back on. MG: This one is a two-parter: 1) What’s the weirdest thing you’ve ever used a nail file for, and 2) What’s the weirdest thing you’ve ever used to file a nail? MF: 1) I’ve used nail files to distress my daughter’s jeans! And 2) As a file, I’ve used a concrete wall – dragged an uneven nail on the surface to smooth the nail edge. 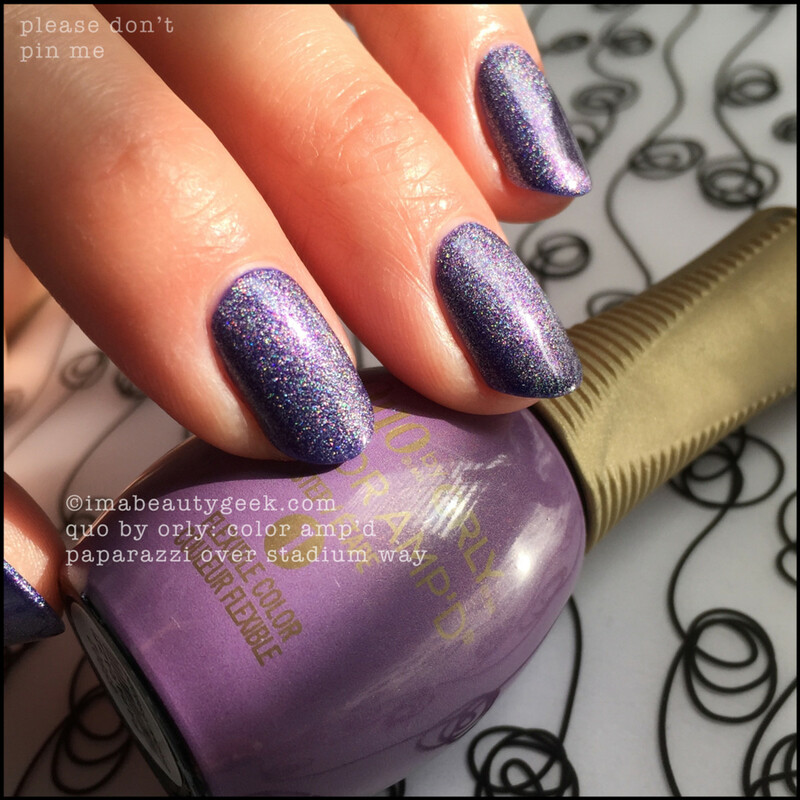 Paparazzi over Stadium Way - yes, scattered holo. MG: When people say they’re taking a break from nail polish so their nails can breathe, what’s your reaction? MG: Right? People be crazy!! I say, "Nails don&apos;t have lungs." MG: How many bottles of nail polish is too many bottles of nail polish? 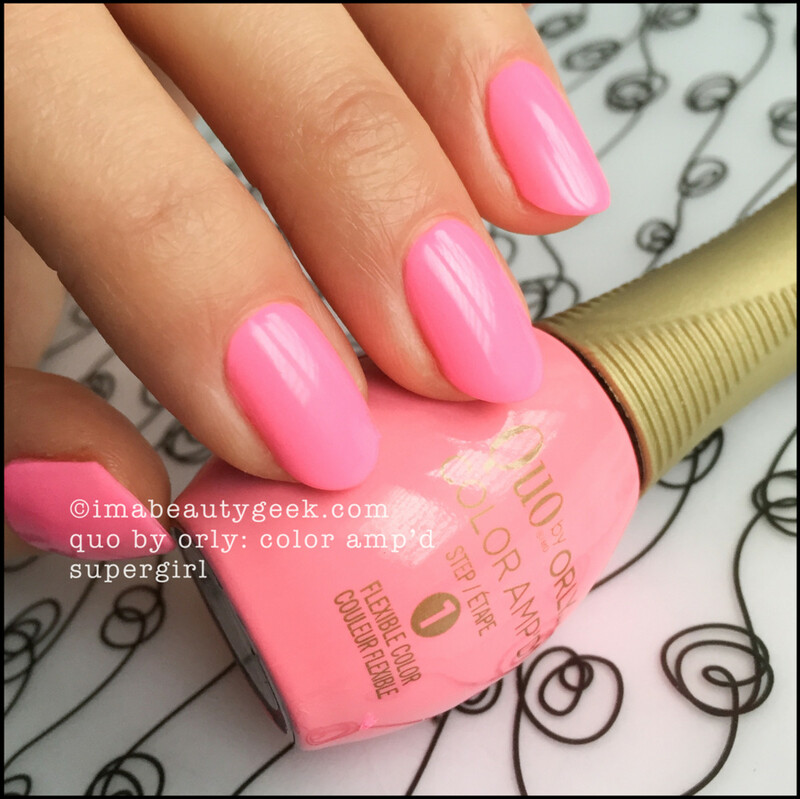 Quo by Orly Color Amp’d Pop Culture - yes, neon. 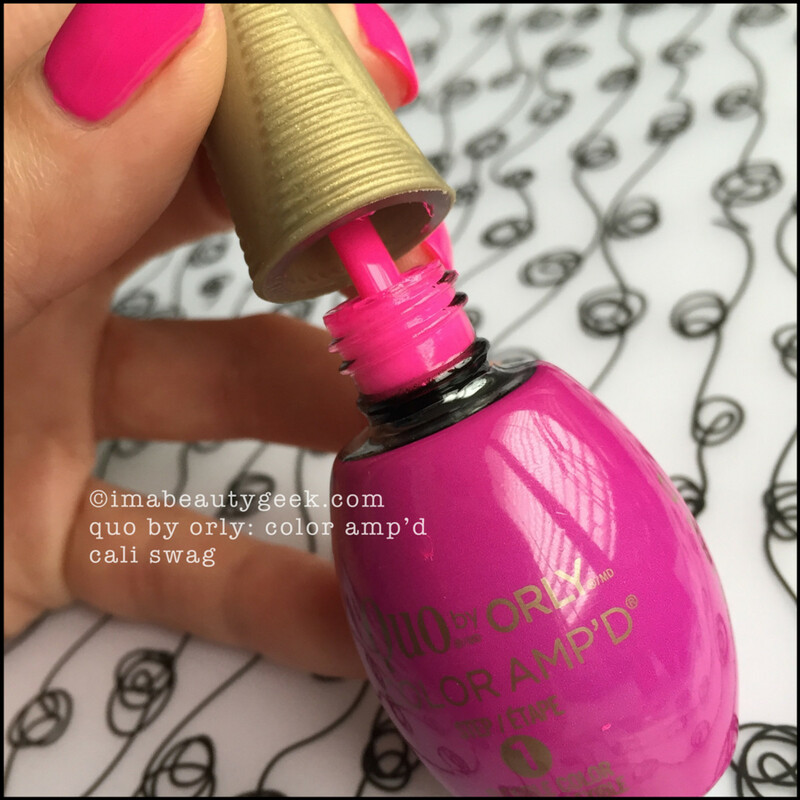 MG: This stinky fume-tastical needs-ventilation top coat: let’s rank it! 1 is the lowest, 5 is the highest/most awesomest. ease of use – 4. If it weren&apos;t for the smell, I&apos;d give it a 5.
shine – 4. I actually compared this to professional brands and found the Quo to be a bit less shiny. For mass market though, it’s really good. dry time – 4. I hate giving it a 5 because there’s always room for improvement, no? It actually dries fairly quickly, especially in thin coats. removal – 4. 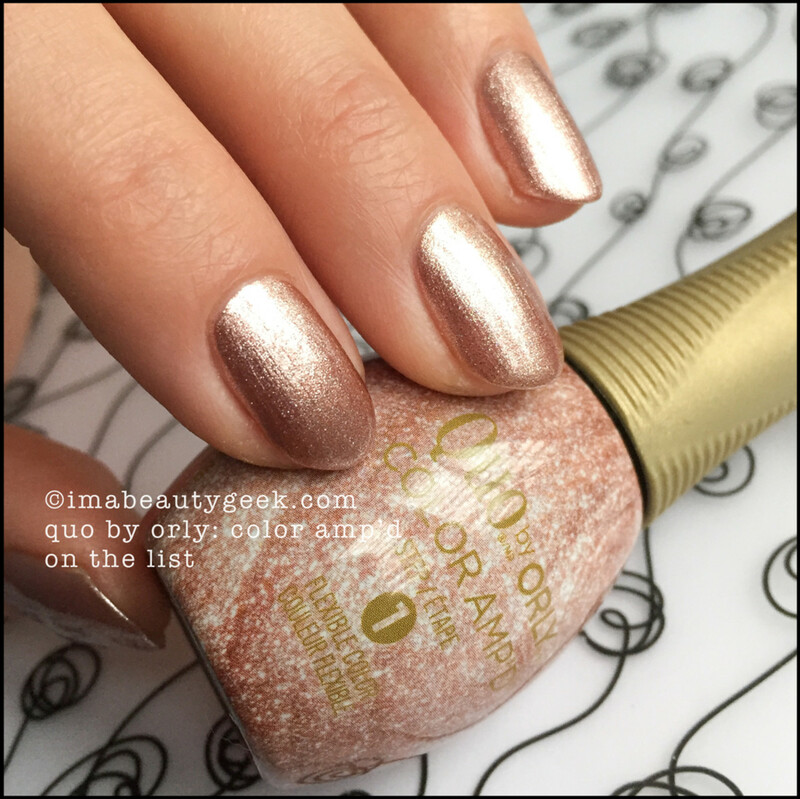 Zero staining, but you do need to hold the acetone against the nail for 10 seconds to break the polish down enough to simply wipe it away. 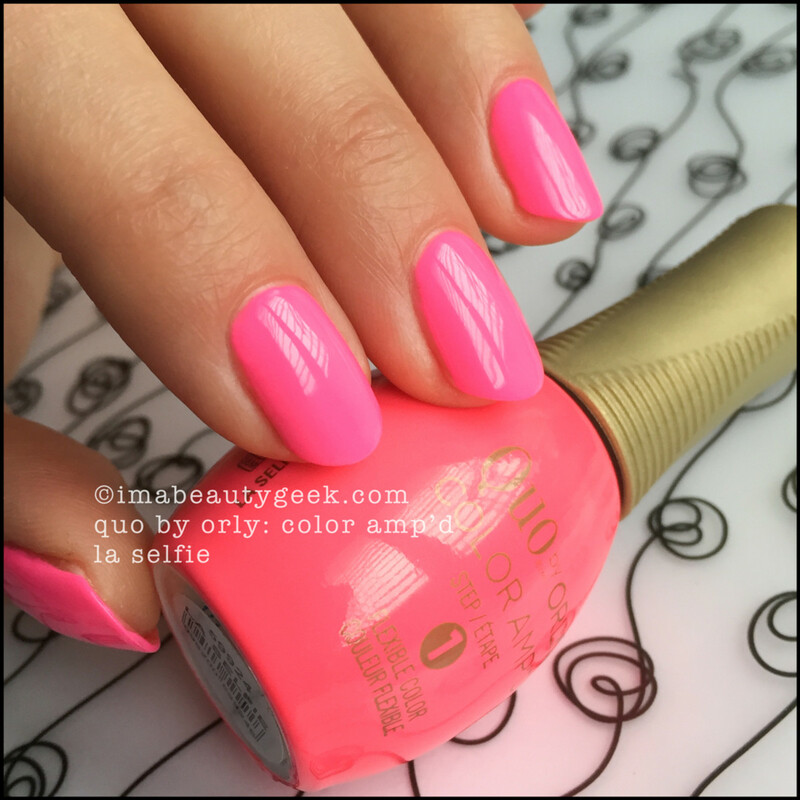 Quo by Orly Color Amp’d LA Selfie - yes, another neon. MG: And lastly, what’s your favourite snack food? MF: Ms Vicki’s Chips. Plain! MG: Hahahhaa!! I get mine at Shoppers! Do you? 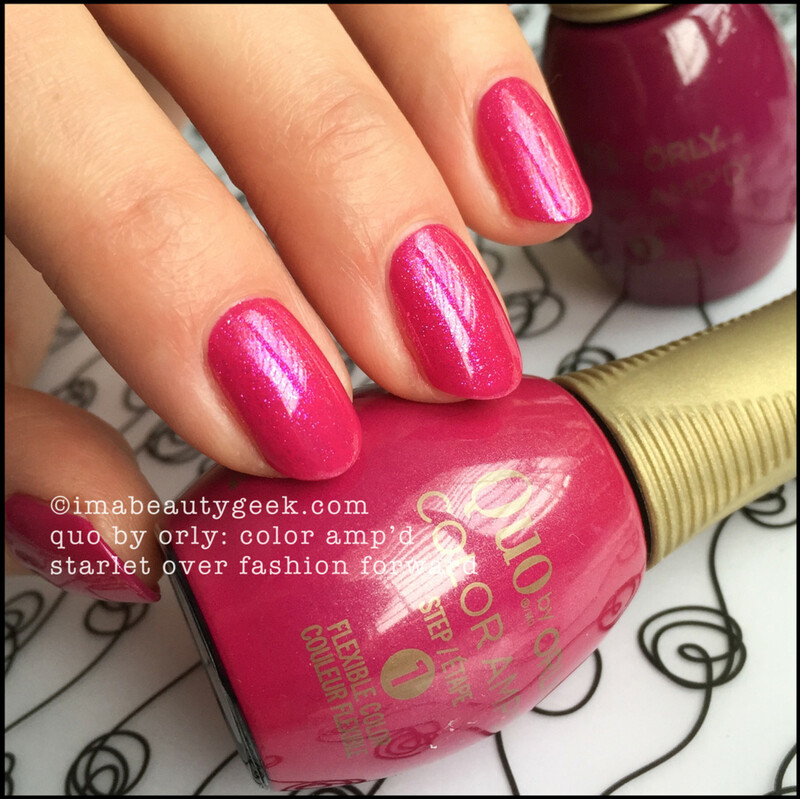 The Quo by Orly Color Amp’d line launched quite recently (you may have spotted it in your late night polish shopping runs) with these 24 shades of happy + one über-magical top coat. While the colours aren’t ground breaking (they can’t be – it’s a launch collection so has to appeal to The Masses), the shades are on-trend and the stuff goes on well and levels well. With the addition of the magical top coat, it’s cray-zeeeee shiny. 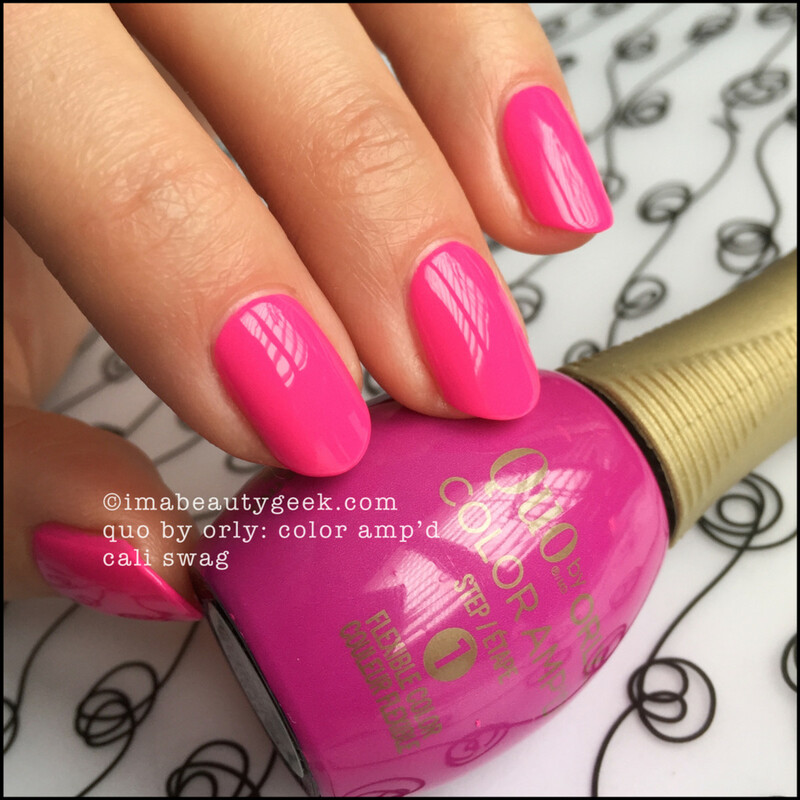 Quo by Orly Color Amp’d Cali Swag – more neon! I did find a slight disconnect with some of the bottle labels and the shade that’s contained inside. 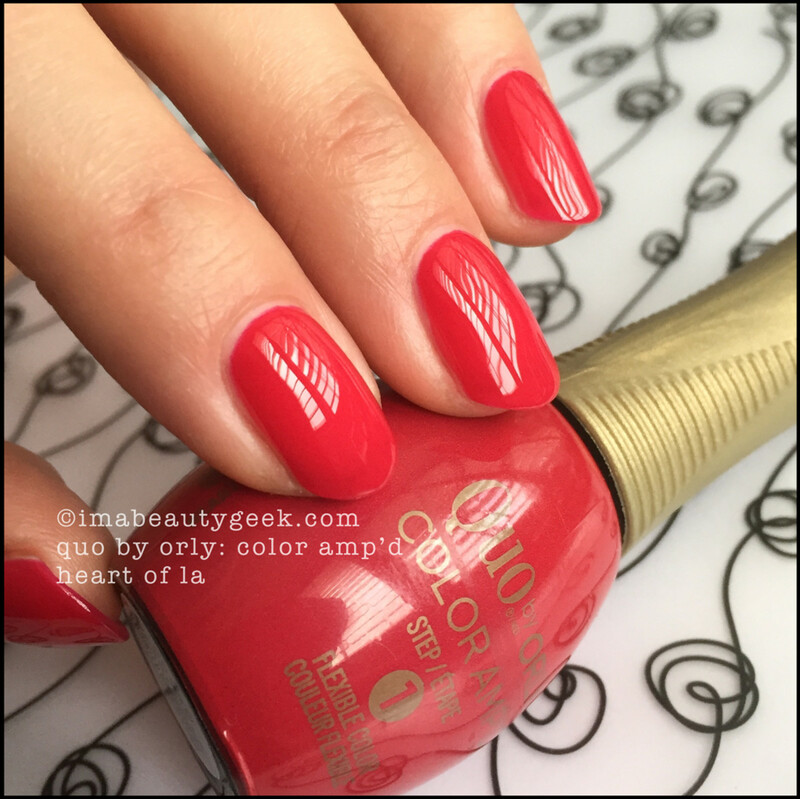 Some of the labels don’t accurately represent the actual polish colour. It might be a good idea for you to pop the top in-store and make sure what you see on the outside is what you get on the inside. 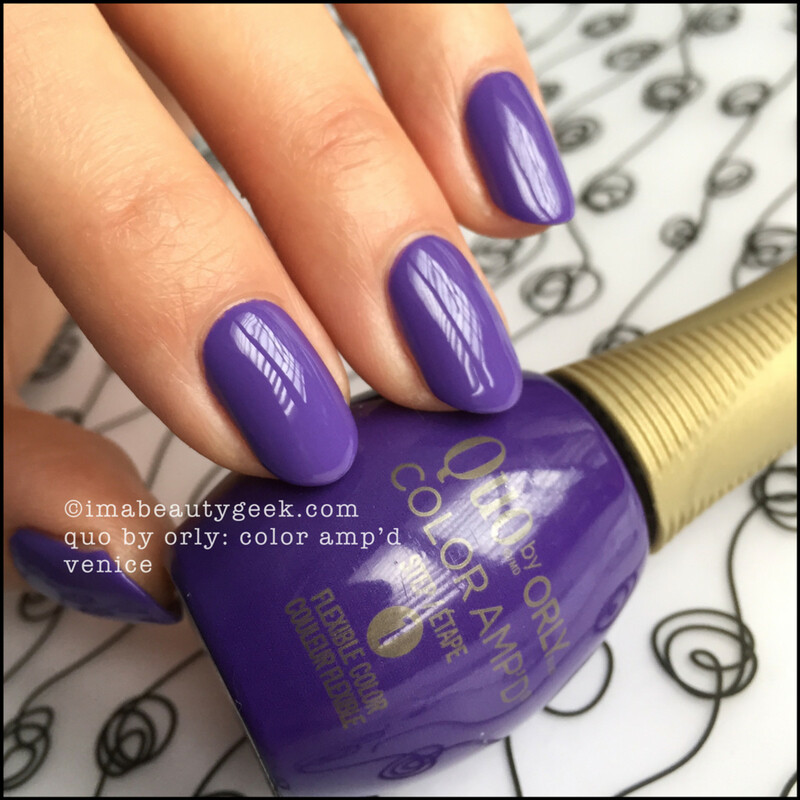 Quo by Orly Color Amp&apos;d Cali Swag (above) – there’s a big difference between the shade on the wand and the bottle label, right? 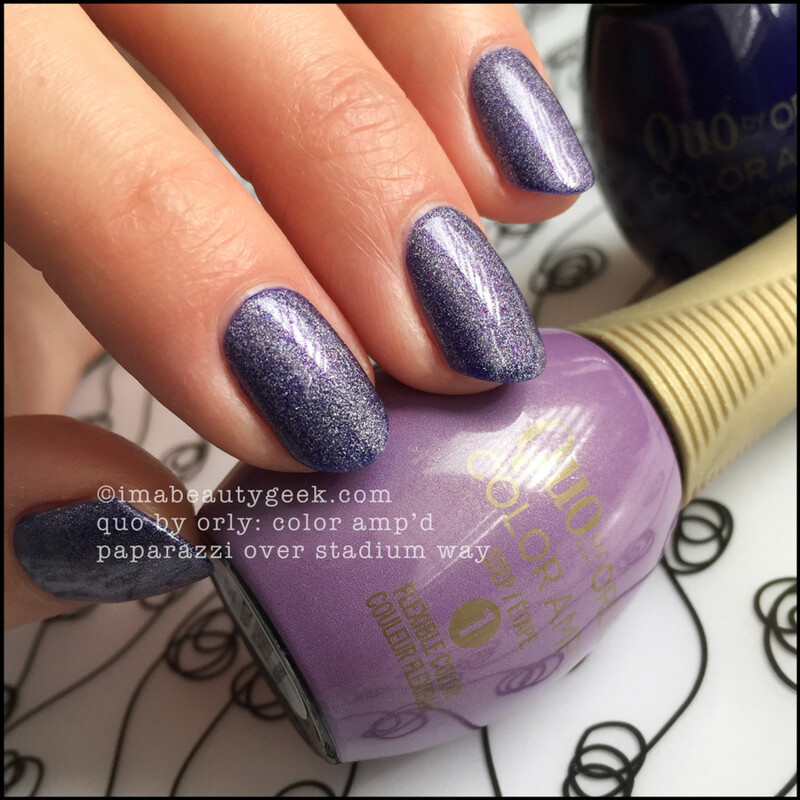 If you’re in the US, you’ve seen this stuff and know it as Orly Epix. 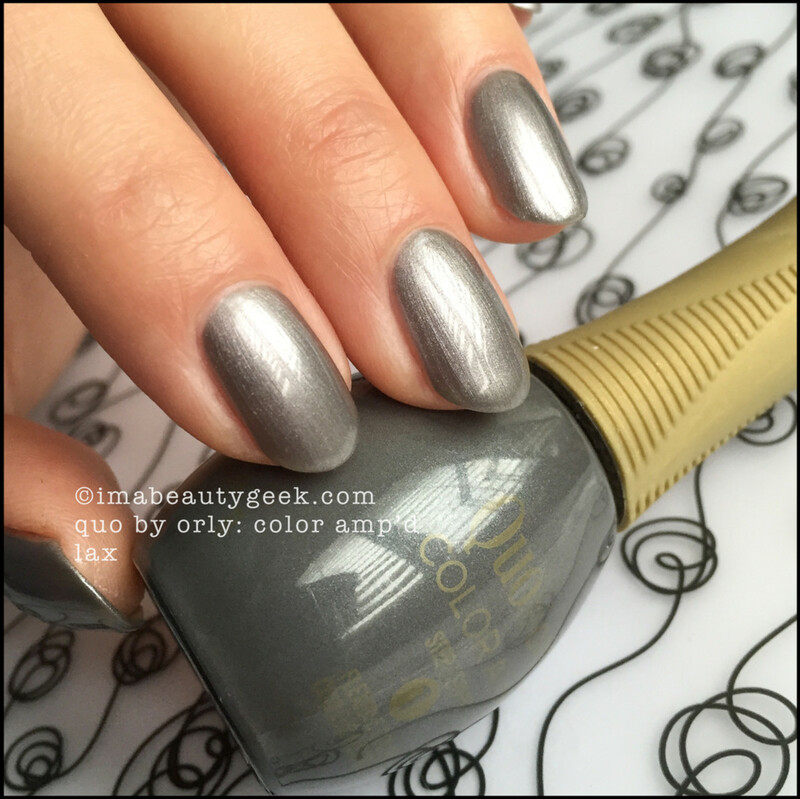 The top coat is called The Orly Epix Step 2 Flexible Sealcoat and if you’ve used it, you know it stinks (you should have adequate ventilation when you use it) and you know it dries nearly mind-blowingly fast. Somehow, it also bounces back from accidental dings. I like it. I think it’s great. 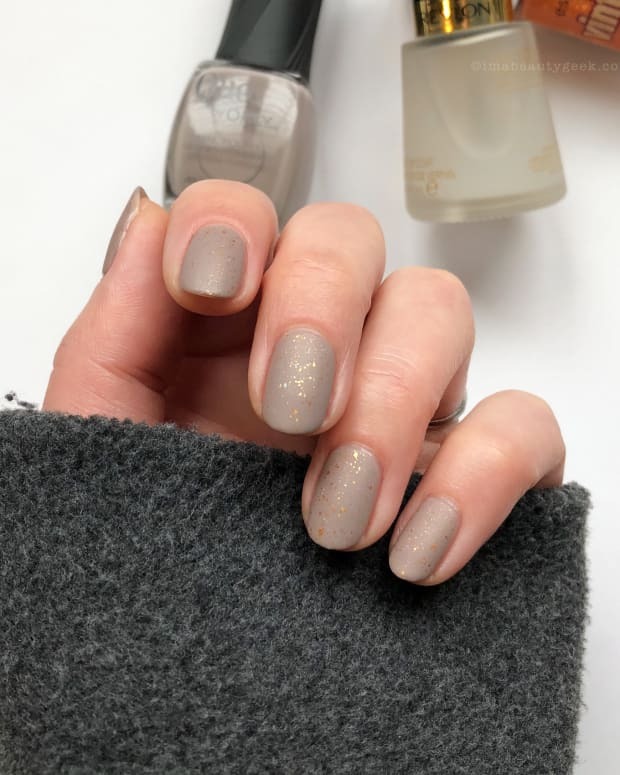 I think it might be one of the very best top coats you can currently find at a mass-market retailer in Canada and the US. 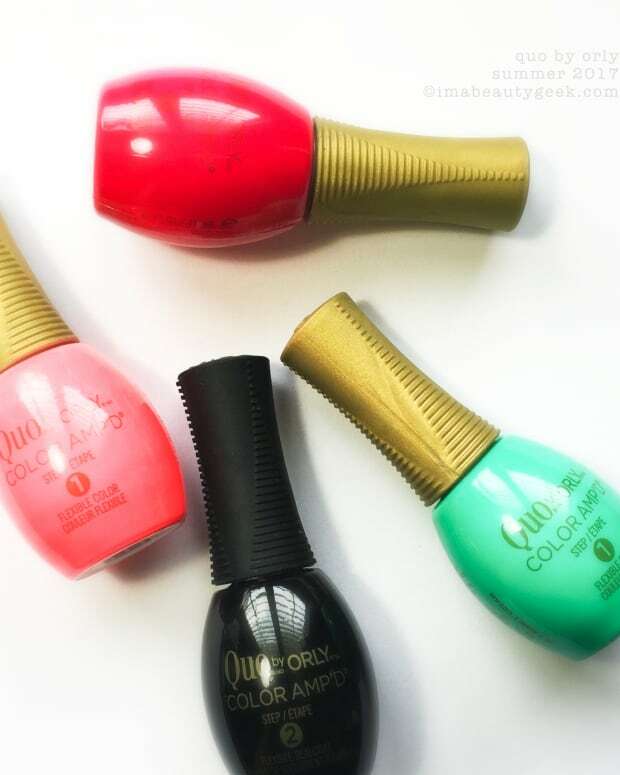 Have you stuck your digits into Quo Color Amp&apos;d at Shoppers Drug Mart in Canada yet? 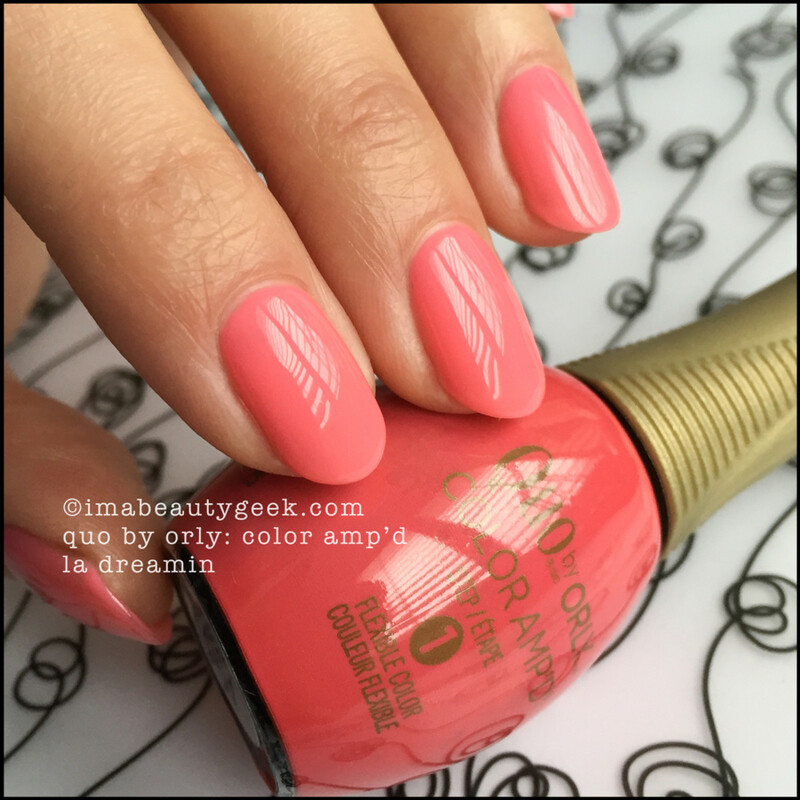 Or, if you&apos;re in the US, have you tried the Orly Epix (available at Ulta.com) or the Orly Color Amp&apos;d that&apos;s exclusive to Target.com? Do you have thoughts? Experiences? Share! 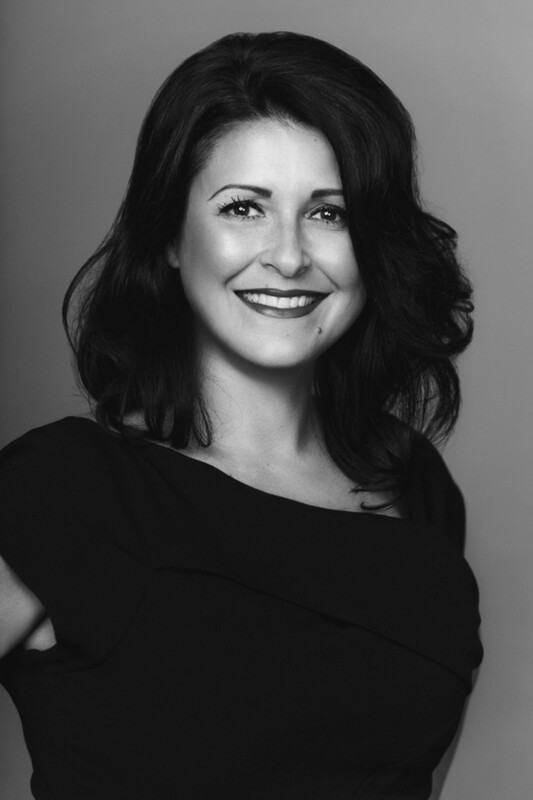 Special thanks to Melissa Forrest - Nail Pro/Brand Ambassador for Shoppers Drug Mart & Magical Painter at Tips Nail Bar.